Future Health Services Inc. (FHS) was established in 2011 by the not-for-profit South Central Community Development Corporation (SCCDC) to provide telehome monitoring services to chronically ill patients in Southern Ontario. SCCDC operates as a Social Enterprise where all profits generated from operations are reimbursed through the participating local Community Future Development Corporations (CFDCs) back into their local community. Telehome monitoring is similar to telemedicine, in the sense that it allows healthcare professionals to communicate confidential information at a distance. This drastically improves patient care, and minimizes distance barriers. Telehome monitoring differs from telemedicine because it is relatively inexpensive, and has the ability to transfer biomedical data from patients to caregivers or health care professionals. Remote patient monitoring is a type of telehome monitoring used by FHS to monitor patients from the comfort of their own home and share the information with their care providers. FHS as well as local healthcare professionals will provide the installation, training, and technical support of the remote health monitoring equipment so that patients can manage their health care in an effective way to improve overall quality of care and maintain a healthy lifestyle. Your circle of health care providers in your community may include Paramedic, Physician, Nurse, Pharmacist, Personal Support Worker, Family members, etc. 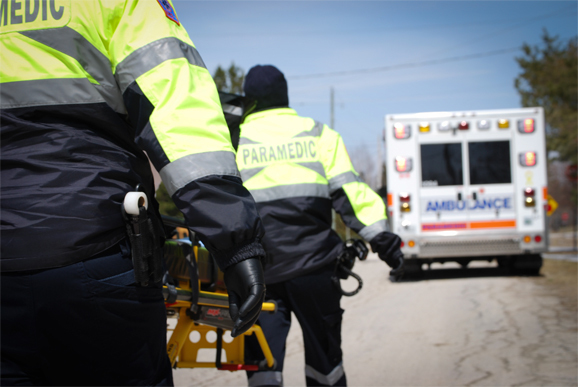 The CPRPM program is an initiative of Community Paramedics across Ontario to keep patients with chronic illness, such as congestive heart failure (CHF) and chronic obstructive pulmonary disease (COPD), safe at home and out of the hospital. Through a partnership with Future Health Services, this free, innovative program is designed to improve quality of life, as well as to improve communication amongst health care providers to deliver the highest quality of coordinated care. As choice providers of the Future Health Services telehome monitoring products, the Ideal Life system is very simple and easy to use. Once identified as a candidate for Community Paramedic Remote Patient Monitoring by paramedics or other health care professionals, a Community Paramedic will set up your home with convenient and easy to use devices. You will receive a combination of devices based on your specific health condition such as a weight scale, blood pressure monitor, heart rate monitor, glucometer, and a Pod that connects these devices to your Community Paramedics in real time. Using these devices daily will allow your Community Paramedic to monitor your biometric data. If the recording goes outside of the threshold set, an alert will be generated and you can expect a phone call from your Community Paramedic to review your current health status. Please fill out the request form in the Contact Us section or you can call us at 1.866.997.9928.